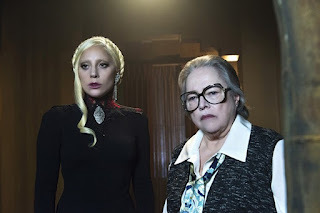 It’s hard for me to keep nitpicking the same eight things over again as American Horror Story continues shamelessly pretending it’s The Shining, trying to reinvent the vampire genre, and its plethora of problematic portrayals. So with that in mind, this week I thought I’d give a little praise to the exposition in this episode, which gave us more information about the Countess after weeks of enduring a lot of self-pitying scenes with Lowe. Though nothing super shocking was revealed about Elizabeth’s past (we all guessed that she was March’s wife, right? ), and the use of F.W. Murnau was odd, it was still nice to see Gaga get a chance to shine a little more and play a wider spectrum. It was also nice to see some real care taken into fleshing out her character. I will say, while the backstory was interesting, Finn Wittrock’s portrayal of Elizabeth’s old lover was pretty awkward and unbelievable, especially next to Evan Peters who has been doing a surprisingly good job with March’s eccentricities. And while the backstory tries to ignite familiarity by using pieces from Dracula’s story (the Carpathian Mountains, thrall, etc.) it never commits to any one aspect and the result is some kind of messy slew of vampire folklore. And even with new information on Elizabeth’s sires, nothing interesting was gleamed from the mythology Murphy’s writing is trying to create. Ultimately, it all feels watered down and, like Asylum, like it’s trying to stretch itself in too many directions instead of focusing in and expanding the already present elements. The episode begins with the hotel’s renovations in full swing. Drake informs his son he plans to stay at the hotel with Elizabeth “forever” before a foreman informs him that a 1-inch thick steel wall is lining the hallway. They send two men to tear it down, but those men are attacked and killed by two of the ghoulish creatures. Lowe is in the West L.A. Health Center for evaluation, as he believes he’s having a mental breakdown after he attacked his partner. But he’s still trying to investigate the Ten Commandments Killer, despite being on his own and the illegality of the investigation. Alex tries to convince him to go to another location for treatment but he claims he saw the name of this hospital on the case file and intends to stay. Elizabeth and Iris converse about the tears in the walls and the Countess seems genuinely scared. Another creature then attacks a guest at the hotel as she answers her door. In a flashback to 1925, we see Elizabeth meeting Rudolph Valentino (played by Finn Wittrock) for dinner and dancing before Valentino’s wife finds them. The couple is getting divorced, but his wife quickly reveals that story is PR, and joins in on their night. Later, March hosts an opening night party at the hotel and Elizabeth learns her lover has died. Just before she can jump out a window, March pulls her in and says he will never let her go, hinting to the audience that they’re married. Later she begins delivering roses to the grave of Valentino before learning from his wife Natacha that Valentino is actually still alive. He faked his death after being offered immortal life from F.W. Murnau, the director of Nosferatu (yeah, it’s as weird as it sounds). Valentino and his wife then turn Elizabeth while March watches nearby. After hearing a guard in the criminally insane ward discuss a known killer in room 153, Lowe overpowers the guard and breaks in. Inside he finds Wren, who admits to helping the Ten Commandments Killer with the murders at the church and that she was present for other killings. Despite Wren showing no remorse for her actions, Lowe offers her absolution, seeing his daughter in her, and insisting she is not responsible for the killer’s mistakes. Really, he’s speaking to the parts of Scarlet he sees in her, and is trying to express that his daughter isn’t responsible for his actions. 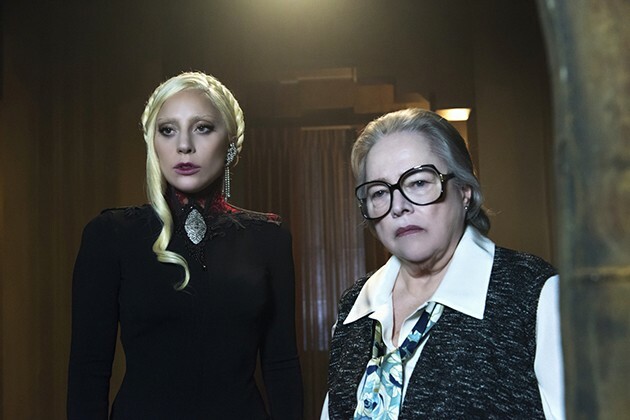 It is also revealed Wren is related to the killer, though she insists he is not her father, who abandoned her in 1986 outside the Hotel Cortez where Elizabeth turned her. She offers to take Lowe to the killer if he can get her out. It is then revealed that Valentino and Natacha are the ghouls in the walls and that they return to normal after they feed. They have an argument that ends quickly when they hear guests, which means they have more to eat. March and Elizabeth then dine together (as they do once a month) and she informs him she plans on marrying again. He seems positive about the plan but suggests she murders Drake off property so he’s not trapped with them. She counters that she may have found love, but March insists the only person she ever loved was Valentino and reveals that he had locked him and Natacha up in the walls. Said couple, now returned to their normal states after feeding, walks out of the hotel. Back at the hospital, Lowe and Wren escape but when Lowe informs her he intends to kill the Ten Commandments Killer, she apologizes and runs into traffic, where she’s hit by a truck. Check back here for more recaps every week!